You how it is with digging out old pictures of football matches from the archives, they are quite impressive in their poor quality retro-coolness. I wish there were so many more of them available [and of course there might be and I have not been looking in the right place yet] but for the moment I will be thankful for what I find. I suppose that since cameras were much more basic than today it must have been very difficult to get a good action photo, therefore many of the other ones taken at the time were blurry and unuseable, so presumeably destroyed. But what I like most about this picture is that in the background you can clearly see the houses in Watson Street so it was taken before the Shed was built [those very houses are still there a hundred years later]. Well I always like to come across pictures which have new [to me anyway] images of Brockville Park. The match itself is quite annoying as Falkirk were beaten; the holders knocked out in the First Round. 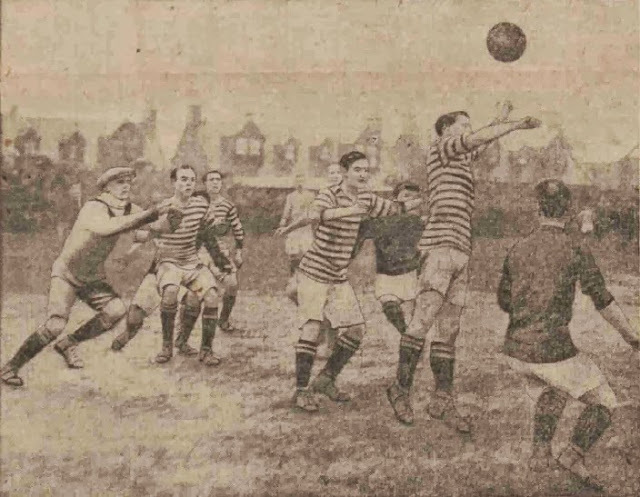 That sort of thing just doesn't happen anymore, and it is a shame it happened to Falkirk on this occasion, as [due to the war] the club would not have the chance to avenge it until 1920 [when Falkirk were beaten again in the First Round]. Will get back to looking through lots and lots of newspapers now, will be back when I find something of interest. I rarely publish much about the great moments in the history of Falkirk FC, if you really want you can generally find it somewhere else, I like the slightly out of the ordinary to the outright obscure. But I was asked today which coloured shirts Falkirk & Raith Rovers wore in the 1913 Cup Final, and I simply did not know: so I found out. Falkirk's attempt at this silly trophy [well admit it, it is hardly the Stirlingshire or the Falkirk Charity Cup] in 1913, it could be said, went very well smiting all and sundry along the way. 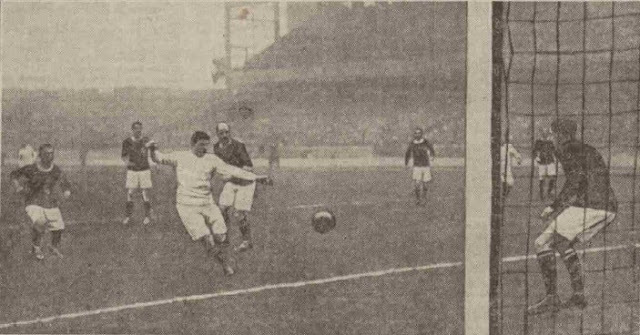 The reason I am posting this is because I found this lovely picture of Jimmy Robertson in the act of scoring Falkirk's first goal in the final. I love this, bit weird Falkirk FC wearing all white, but hey. James Robertson was one of our best Centre-Forwards ever, but now, more than a hundred years ago, is remembered by few. Here is to Jimmy Robertson.